This is Pink Saturday's 2nd birthday over at Beverly's blog "How Sweet the Sound, you should go visit!" 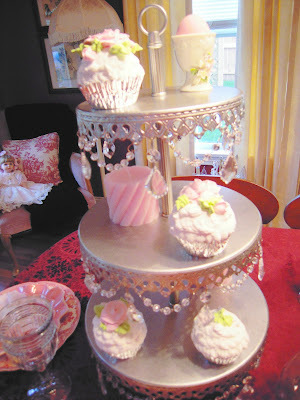 Since it's a birthday, I thought I'd bake a cake..........a pink cake that is...OH and how about cupcakes too!! Happy Birthday Pink Saturday, hope there are many more! I want to eat that cake and c cakes with my bare hands... and mouth, of course!! LOL. Have you read my last post????????????? ?Hop to it!! Melissa your cake looks so yummy! all those creamy pinky cream! can I come and have a slice? hehehe I promise I be good.. and your cuppies are just delicious too! Have a good weekend and Happy PS! What a beautiful cake!! too nice to eat but I bet soooooo yumm!!! How beautiful and yummy looking! I think I gained 5 lbs just by looking. Happy PS! Your cake is so pretty and looked so yummy! Love the colors! Dang that looks good. Off to Shipley's for a healthy breakfast. Man, my cakes NEVER look like that!! What a beauty. They are a lovely birthday offering, indeed. You are so talented! I have been wanting to learn how to decorate cakes and that makes me want to even more! Wanted to come back and tell you how I LOVE the cake stand ON the cake stand with the CLOCHE on it....GENIOUS!